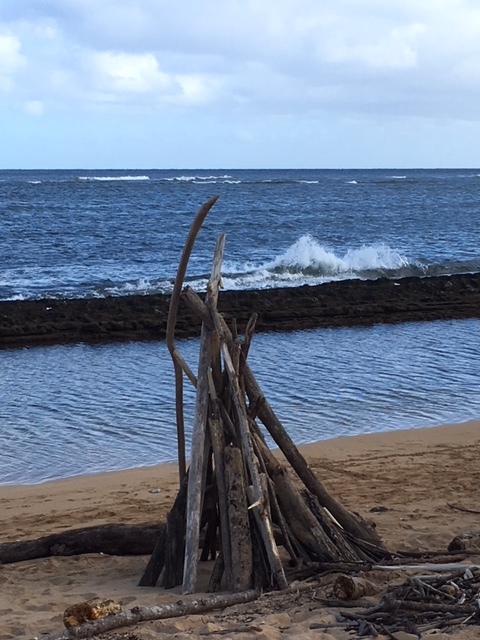 Here’s one way to use some of the driftwood blown up on the beach by a storm: build a lean-to! We’ve had another week of crazy weather here on Kaua’i. There was lots and lots of rain, thunder and lightning and wind earlier in the week, but although the sunshine is back it’s still cooler than usual. Nights have been downright chilly (well, for here). But, the humidity is low and it’s been great for walking – the skies miraculously cleared every afternoon so Brett and I have been able to get out every day except for last Sunday afternoon. Every time I think YaYu is done with this whole college thing, she announces she’s applying for yet another scholarship, and we’ve had to run to Walmart for envelopes and mailing supplies, or to the post office for stamps. This week she brought home a form asking us to shop at Foodland because apparently they donate money to each high school based on the number of families that shop there and mention their school, and that money is divided up among students for scholarships. Foodland is not our favorite local grocery, but we’ll shop there this month to contribute. YaYu will hear back later this month from one of the colleges she applied to – she requested “early evaluation” and will receive a notice of likely, possible, or unlikely. A likely pretty much means she’s in, a possible gives her around a 20% chance of acceptance, and an unlikely means “no chance.” The school is not her top choice, but it will be nice to know one way or another what her chances are there and give her an indication of how she will fare elsewhere. This past week I went through all my cookbooks and recipe files and cleaned out all the things I don’t use or want any more. Back in the day I collected cookbooks, read several food and cooking magazines, and was a big-time recipe saver. 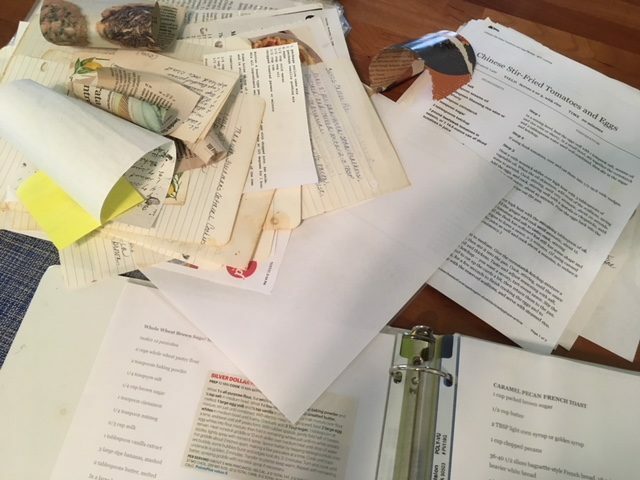 I kept my clipped recipes neatly organized in a set of notebooks but the reality was I rarely fixed any of those recipes – I had cut them out because I thought I might try them some day (and then never did). These days though I mainly go online to find new recipes or look up old ones, and was only using the notebooks now and again for a few family favorites. So, I went through everything, took out the few recipes I wanted to keep, tossed the rest, and organized the keepers in one big binder. I also went through my cookbooks and ended up keeping only four: Mark Bittman’s How To Cook Everything, Better Homes & Gardens Big Book of Slow Cooker Recipes, Japanese Country Cookbook (no longer in print), and Sunset Magazine’s Favorite Recipes, which I’ve been using since I was a teenager. All four have loads of favorite recipes plus plenty I’d still like to try. The rest of the cookbooks will go out at our moving sale or to a local thrift store. I plan to cut w-a-y back on my cooking duties once it’s just Brett and me, so getting rid of recipes and cookbooks I’m never going to use makes sense and means less we have to put into storage. Reading: I finished up Grant’s Memoirs, and am now greatly looking forward to reading Ron Chernow’s biography of Grant, which has gotten great reviews. In the meantime, I raced through Rice, Noodle, Fish: Deep Travels Through Japan’s Food Culture by Matt Goulding this past week. I’m not a big fan of foodies’ tales of the very important or very cool people they got to meet or the very special restaurant they got to eat at or the very special dish they got to try, but Goulding throws in enough cultural stuff to keep the book down to earth for regular eaters like me. He even has a section on convenience store food! It was an enjoyable and quick read, and I highly recommend it for anyone traveling to Japan. The day before I finished it Ron Chernow’s Hamilton finally became available to download from the library so I’m into that now, and hope I can finish it in three weeks! Listening to: Other than a few roosters doing their thing out in the distance, and a few birds signing, it’s pretty quiet outside. We’ve been seeing and hearing lots of baby chicks these days too, but they’re not around right now. Inside it’s quiet too – we haven’t started the laundry yet, and each of us is doing something quiet (i.e. reading and writing). Watching: We finished up Season 2 of True Detective – it started off slow but ended strong (we still like Season 1 better though – Season 2 was complicated). Even though we cancelled our basic cable, it’s still available to us through Tuesday, so we’ve been able to watch some of the Winter Olympics and then will switch to using YaYu’s Roku stick. We watched Keeping Up With the Joneses yesterday evening with YaYu – fun movie! Cooking/baking: Brett’s making Scotch eggs for dinner tonight, and I’m going to steam a couple of artichokes to go with the eggs, and make toast for Brett and YaYu. I baked another olive oil orange cake on Thursday and there’s still some of that, so no baking today. On the menu this week is grilled teriyaki chicken and zaru soba; grilled pork chops with pilaf and artichokes; spaghetti with marinara and meatballs; grilled beef Polish sausages with roasted cabbage; and beef and broccoli stir fry with rice. Happy I accomplished last week: Besides getting all of the cookbooks downsized and organized, I also cleaned out a couple of the junk drawers in our living room tansu. I figure if I just keep plugging away at downsizing by the time things need to be packed for storage, or organized for our moving sale, we’ll be in good shape. Lots of little things got done this past week besides mailing off YaYu’s local scholarship applications. 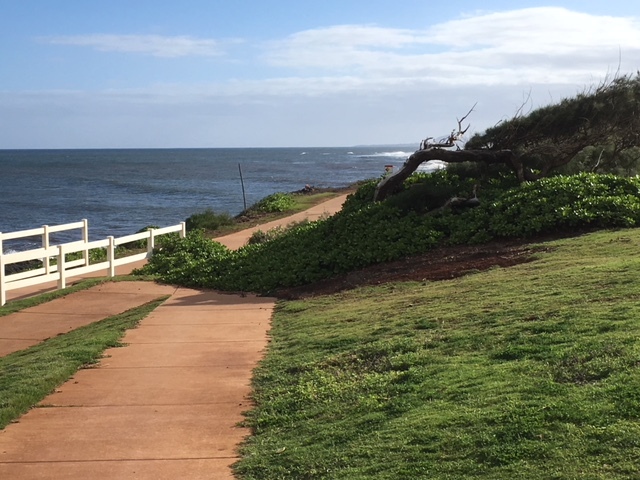 Brett and I walked every afternoon, and tried a new stretch of the beach path yesterday – it was a bit more effort, but lovely. I’ve drunk lots and lots of water, and except for a couple of days I’ve stuck with my French study. I feel like I know lots of words these days, but still can’t say anything. The beach path between Kapaa and Kealia is a little more hill-y than down by Baby Beach, but comes with lots of wide, beautiful views. 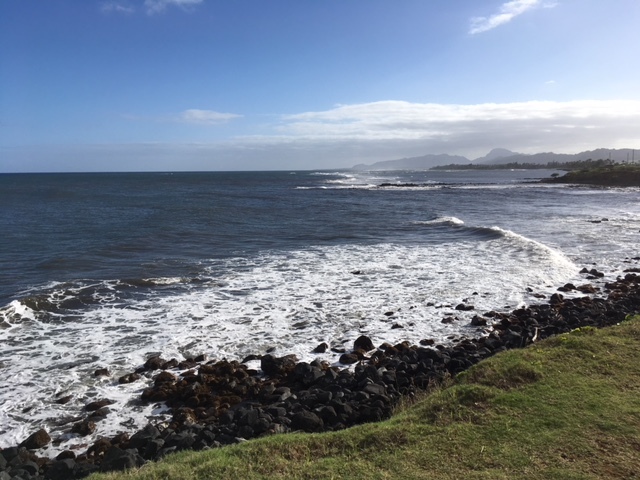 Looking forward to next week: Brett and I are heading down to the south shore on Valentine’s Day to have lunch at Brenneke’s Beach Broiler – hopefully the weather will be nice and we can snag a table to enjoy an ocean view while we sip mai tais. After lunch we’re going to the weekly culinary market at the Kukuiula Marketplace instead of our usual farmers’ market. WenYu’s boyfriend’s dad wants some organic macadamia nuts, and after much searching the only place to get them on the island is from a vendor at the market. Even the natural food stores didn’t have them. We’re just hoping the vendor is there on Wednesday. We’ll still be able to pick up our usual produce there – lots of farmers set up at the market. Thinking of good things that happened: Brett and I rarely do anything spontaneous when it comes to spending, but we had a lovely breakfast at the Art Cafe Hemingway on Wednesday, and can’t believe it’s taken us this long to eat there. We’re both looking forward to going back, and when we told YaYu about the crepe menu she wants to go now as well (we’re thinking for Easter brunch). It’s been a bit of a struggle this week weather-wise, but the sun is mostly back out, the island is drying out and the humidity is staying low. Thinking of frugal things we did: 1) We finally cancelled our basic cable TV, a savings of $11 per month. We’ve only watched TV via streaming services the past several months and decided we didn’t need the cable. 2) We cooked all meals at home except for our spontaneous breakfast out. 3) We all ate leftovers for our lunches everyday this week, including YaYu. She said her friends envy her leftovers! 4) I ran out of my favorite Mrs. Meyers bathroom cleaner, but instead of buying more made my own cleaner with vinegar and baking soda. 5) We put $21.50 into the change/$1 bill jar: $4.48 back from the cable bill, $3.98 from Walmart (mailing supplies); $10 change from the farmers’ market, and $3.04 from recycling. Bonus question: Have you ever spent the night in a hospital? Too many times, in my opinion! I’ve had six overnight hospital stays beginning with having my tonsils out when I was three and ending with surgery to repair a fractured kneecap when I was 46. Other than the tonsilectomy (one night), I was in the hospital for around a week each time, including when our son was born, but when I had my knee surgery I was discharged in two days. I guess that’s a good thing though the more we’ve found out about the nasty infections you can pick up in a hospital. What I remember most about my hospital stays was how noisy it was, and how I was constantly being awakened for something (vital signs, take a walk, roll me over, etc.) when all I wanted to do was sleep. The only wake-ups I didn’t mind were the ones to nurse our little boy. That’s it for this week? How did your week go? What did you accomplish? What good things happened for you? What are you reading? Next Post An Invitation . . . I always want to comment on the “Sunday Afternoon” post and never do… but today is the day! This is one of my favorite weekly posts of all the blogs I read, so I figure I “owe” it to be interactive, ha. 😉 Accomplished: It is assessment and report card time for me, so I am happy to have accomplished all of our language arts assessments (minus two individual make-ups) and have also entered the data in various places. This coming week we’ll do our last math test of the trimester, and then I can get report cards and accompanying materials ready for conferences starting the 27th. Cooking: We made and ate dinner at home every day last week, and of course I had a packed lunch every day. We did treat ourselves to lunch out on Saturday at a newly-opened Mexican restaurant I’ve been wanting to try. Today I baked a cake from a box mix which will be topped with homemade lemon buttercream frosting, and also made two loaves of banana bread and a batch of spicy tomatillo salad dressing. Reading: This week I finished “Man Overboard” by J.A. Jance and read “Brown Girl Dreaming,” a wonderful YA novel by Jacqueline Woodson.I finished listening to “I.Q.” by Joe Ide on Audible while driving, and started “The New Jim Crow: Mass Incarceration in the Age of Colorblindness” by Michelle Alexander. It’s heartbreaking and eye-opening. Good things: Kids made demonstrated fantastic growth in reading since November, which is always satisfying! I can very closely identify with what you’re going through with testing, grades, and paperwork. I taught adults (non-credit), and although I didn’t always have to assign grades there was always LOTS of testing and LOTS of paperwork to complete. The worst part was that the testing and paperwork requirements changed every term. I’m not kidding! It was nuts, and one of the reasons I “retired” early. I often make cakes from a mix, but always, always make my own buttercream – it’s so easy and tastes so much better than anything you can buy from a store. I wasn’t going to bake today, but ended up making a quick apple cake. I have a recipe for a rum cake that I want to try soon that uses a mix, but have to wait until we shop to get a small bottle of rum and a box of vanilla pudding. I have already put The New Jim Crow on hold at the library. Thanks for the recommendation. And, I am so happy you took the time to comment. I am not very good at commenting on blogs – it always seems someone else has already said what I would, and my introversion kicks in as well. I keep urging myself to do better, but know I still come up short. I’ve spent the night in the hospital three times. Once as a toddler and twice as an adult…. I’m about to start reading Y is for Yesterday. I was so sad to hear of Sue Grafton’s death. Sorry to hear about not liking your job – are you thinking of leaving and only have a few more weeks to go, or staying or ??? I’m hoping you don’t have to hang on to a job you dislike – it’s so draining, both emotionally and physically. Believe it or not, I have not read any of Sue Grafton’s books, and I have no excuse. My mom loved her books and had read almost all of them. It is especially sad that she passed away before getting to do the last book in the series (Z). Maybe it’s finally time for me to get going on them. Your schedules are so busy, both with work and the boys’ schedules, but I don’t know anyone who gets more done than you. You are an inspiration. Even though it’s overwhelming at times, enjoy your time with the boys – it goes all too fast. I almost cannot believe that YaYu, my youngest, will be going to college. Where did the time go and how did it go so fast. Happy belated birthday! Cupcakes and sugar cookies sound wonderful to me! I have been wanting to ask you how you seem to come up with such good blog posts? I’m trying to get into blogging and have set myself a goal of 30 posts before I tell anyone I am even blogging. I feel like I’m boring and come up empty on blog post ideas. You are actually the first person I have told about my blog! I have 8 children and love living a simple life in Australia but is my life TOO simple to write about? Wow! I am honored that you’re asking me this question! Don’t ever think you’re boring – EVERYONE has an interesting story to share. Eight children – that right there is very interesting and makes me want to know more. How old are they? What are your days like? How do you manage your finances? Cooking? How do you define “simple living” when you have eight children? I’m already eager to read what you have to say! My son once said that people blog because they like the sound of their own voice, and there’s some truth to that. Write for yourself first – tell your stories to yourself, and you will find your voice and your audience. When I started blogging (nine years ago!) about getting rid of our debt I wrote every day – I felt like I needed to put everything down, for myself if no one else. But eventually I settled into a pattern and wrote about things that interested me and people started arriving to read what I had to say (which still amazes me). So maybe you could write about childrearing one day, and on other days write about cooking for eight children, things you like to do for yourself, books you’re reading, financial issues, hobbies, etc. Write about what interests you, and what you like to read about in others’ blogs. Write for yourself. You are your own best audience and reader. Thanks for replying. From your blog I am most interested in how you budget and seeing the change you return to the budget….how it all works. I’ve used the search function on your blog but haven’t found the right post. I love sewing and do it most evenings but I heavily pregnant now so it is hard to baste quilts these days. Thanks for the encouragement on blogging. I did blog years ago but rarely got commenters and when I did it was trolls writing filthy comments. We try to use cash as much as possible, and then spend under our monthly budget, with the change going into our travel fund. For example, we budget $20/week for the farmers’ market, and anything we spend under that goes into the change/$1 jar. We started with just putting away change, but then after a couple of years of that we upped our game and started setting aside $1 bills as well. It becomes a habit after a while, as does finding ways to spend less than we’ve budgeted. I highly recommend using WordPress if you start blogging again. It’s free, and comes with a powerful spam filter. Also, no anonymous comments allowed – you see everything and can put it in the trash and easily block people you don’t want commenting. I’ve found that staying positive draws in positive comments. I’ve had only one nasty commenter in the nine years I’ve been blogging. I hope you go for it – I think you have quite a life and story to write about! Your recipe purge sounds the same as the one I did a few months back. Like you, I had saved a ton of recipes that looked good but have never been tried. I decided to put the ones that still looked good into a giant paper clip and not file them unless/until I try them. The first one was a dud and ended up in the garbage. Ha! I have more cookbooks than you do and some went to the library, but some are still hanging in there. Another purge this summer maybe…. We had a slow week, as we both picked up a bug on vacation. I got a cold, but DH got what appeared to be the flu (shot notwithstanding) and it turned into bronchitis. He was sick in bed for a few days and is finally back up and about. That meant all the dog walks, home tasks (shoveling snow), and cooking were up to me. So it’s been a tiring week, and I think we went to the warm weather too soon. Spring seems pretty far off since it’s been snowing every day. But we FINALLY have the sun today. Whew! My hospital stays have been surgeries (appendix removed, etc) and childbirth (3x). While I hate the lack of sleep, I always REALLY hate the plastic mattress covers. Looking forward to a week with some sunshine, getting out and about again, and I’m also really appreciating the days getting noticeably longer! I like your idea of clipping the recipes and keeping them until you’ve tried them. I really don’t plan on cooking much once Brett and I are on our own. It’s not that I’ll never cook, but I’ve told Brett we’re going to rely more on things like soup and sandwiches, prepared food from the deli, etc. and will go out a bit more often then we do now. Nothing fancy, but letting someone else do the cooking. 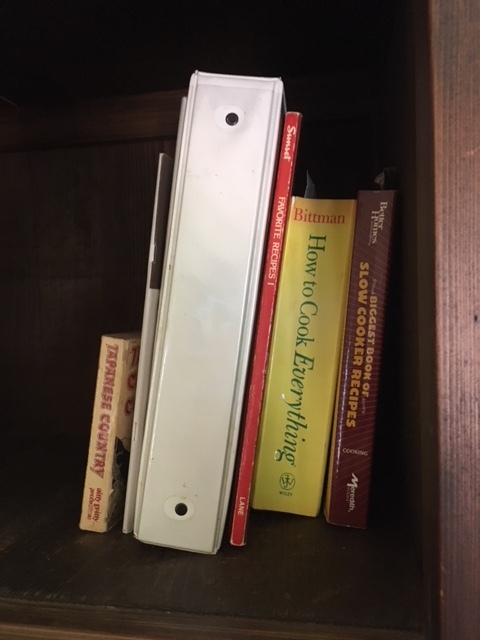 It felt better than I thought it would though to get rid of all those recipes – as I looked through them I kept wondering what had made me clip them, and I also thought about the reason others had become favorites. OMG – I forgot about the plastic mattress covers! The WORST! Hope you and your husband are both feeling better. We’ve stayed will this year and hopefully we can keep it up. The flu has arrived in Hawai’i, but nowhere near as bad as back on the mainland. No colds for us either this year . . . so far. Usually one of the girls brings one home and then we pick it up from them, but YaYu has stayed healthy this year . . . so far. We tried a new restaurant last week too – a small taqueria tucked into a little strip mall. DH liked it a lot; I’d give it a pass. I too am mostly using online recipes or just throwing things together these days although when I do delve into a cookbook and actually make something it is usually great and a nice change from our routine. This week’s online recipe was pear muffins. Looking forward this week to heading to our son’s in Berkeley and hugging the whole family. Granddaughter is now 15 months old and of course changing quickly. I’ve spent way too much time in hospitals. 4 major surgeries and one cardiac event plus (the happy occasions) the birth of my 2 sons. I am grateful for modern medicine but really dislike being in the hospital. I hope the news for YaYu is encouraging! Before I ever buy another cookbook again I’m going to check it out first from the library and see how I like it before buying. And even then I’ll check first to see if the recipes are online – so many of them are now. I feel just like you do about hospital stays – thankful that the issue was being taken care of, but hating the noise and busy-ness of the setting. Have a great visit to Berkeley! The grands do change so quickly, don’t they? Every time I see a picture of our two I am so surprised by how much they’ve changed, especially the baby (who is now 16 months). We decided a couple years ago to cut our cable, but the one thing I miss is the Olympics. Are you able to get them through the Roku? We have a Roku, but I can’t figure out how to get them. It turns out for us that we can’t get the Olympics through the Roku (have to be connected to cable) but we can through Hulu, and can also watch online at nbcolympics.com. I forgot to answer the hospital question: one knee surgery as a teenager, 1 sewing needle removal from other knee as a young teen, 8 csections and an appendectomy. Knee surgery was awful. I completely understand now why gangsters and such always went for someone’s knees when they wanted to hurt them. The healing takes forever. One of my surgeries was an appendectomy as well. I had appendicitis for three days before they could figure out what was wrong, and my appendix was ready to burst when they took it out (which would have been a real problem if it had). I was only 16 then, and back on my feet pretty quickly as soon as they let me out of the hospital!